I’ve got FOUR photos from my recent trip with the family to Adobos Caribbean Grill in Sandy, Utah. I’d heard nothing but great things about this primarily Puerto Rican restaurant. We finally decided to see what all the fuss was about. 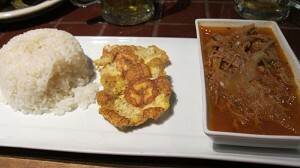 My meal was a sort of shredded beef stew with a mashed plantain and rice (pictured below). Very simple. The beef was fantastic, and the “jus” as they called it was great on the rice. My lovely bride had the bass (pictured below). 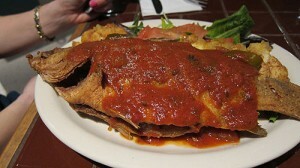 This is a WHOLE fish with head, tail and even the eyeball. We had a lot of fun playing with the eyeball by the way. I’m not a fish guy, but the lovely lady was practically dancing in her chair over how good the bass was. 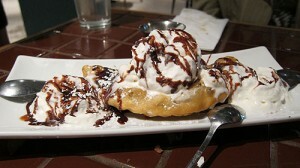 The dessert was unbelievable. Just look at the photo below. Nothing else need be said. Don’t let the modest facade of Adobos fool you. Inside are some great meals, appetizers and desserts. 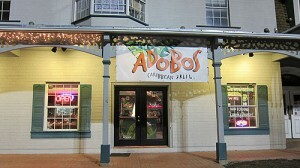 Get to Adobos as soon as you can!